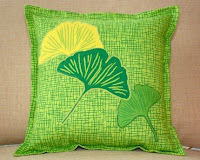 I found so many amazing things while searching etsy for ginkgo, that I couldn't just do one post. Here are today's ginkgo finds. westernartglass is now one of my new favorites. I love that this artist is recycling bottles and turning them into beautiful pieces of art. 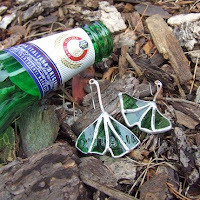 Check out these great ginkgo earrings. This lovely drawing of a ginkgo leaf by AKJapan immediately caught my eye. The colors and simplicity really appeal to me. And now for a YOWZA! This lovely pillow has great, bright colors and it really makes for a fascinating look. Even cooler is that cottageindustrialist designed all of the fabrics!